At an intuitive level, the relationship between urban form and travel demand is quite straightforward. Clearly, where people live, work, and shop is determined by where we build houses, offices, and stores. Similarly, most business establishments, such as stores, offices, or small manufacturers, locate within a built environment of available commercial floorspace of various types. Once the land use pattern, as defined by the built urban form, is established, and once households and businesses make location choices within this built environment, then travel patterns tend to follow in a reasonably logical and predictable manner. In addition, the types of transportation services that can cost-effectively serve these travel patterns is in large part determined by these travel patterns and the urban form which underlies and determines these patterns. Empirical evidence on the impact of urban form on travel behaviour (particularly travel mode choice) is presented in some detail later in this paper. The transportation system (both road and transit), in turn, can influence land development and location choices by providing different levels of accessibility at each point in the urban region, where accessibility is defined as the potential to travel conveniently and cost-effectively from a given point to activity locations throughout the region. For example, it is reasonable to expect that, all else being equal, households prefer to live in a neighbourhood that has high accessibility to well-paying jobs, good schools, attractive stores, parks, and other amenities. In the same way, businesses value accessibility to labour, other inputs (raw materials), and markets. Figure 2.1 provides one example of the impact of transportation infrastructure on urban development patterns. 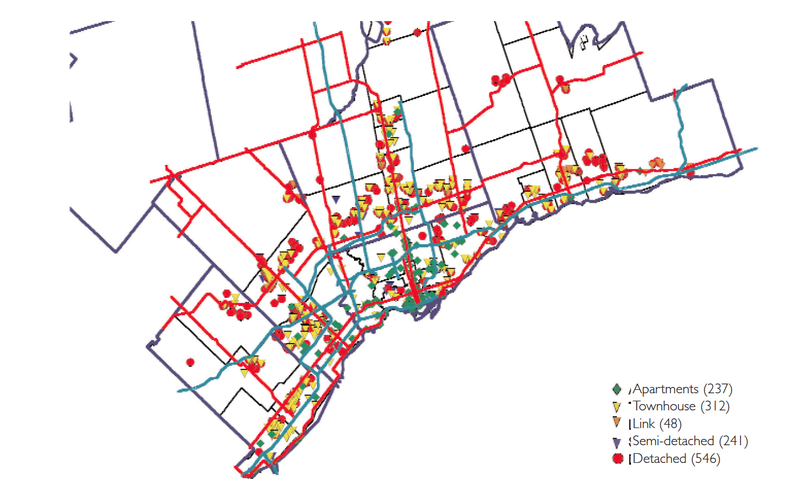 In this figure, all new residential housing development projects of 10 units or more that were started between January 1997 and April 2001 within the GTA are plotted, along with major highways and rail lines. The impact of both road and transit facilities on decisions concerning where to locate new housing is quite evident in this map - most development has occurred close to one of these major transportation corridors.